Bake a double mixture of basic Chocolate Cake in an oblong cake pan. Then pop a chocolate swiss log cake from the supermarket on top. Mix up a batch of thick buttercream icing. Separate into two bowls and add green food colouring to one, and cocoa powder to the other. Get your mama to help if you have a headache. Ice the bottom (oblong) level with green (grass) and the log with the brown. Apply it thick and rough so it resembles bark. Cut/break up Cadbury flake bars into lengths and stick all over the log. Mmmmm. 5. 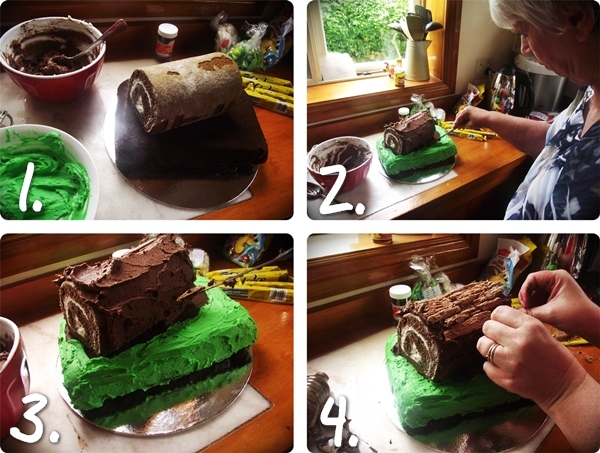 Add a little black food colouring to the leftover chocolate icing and apply at the base of the log with a piping bag, so it looks like mud. Cut snake sweets in half and have them emerging from the mud. Create a spider for the top of the log with a Ferrero Rocher RondNoir ball (body) and slivers of licorice for legs. Use leftover chocolate icing to glue legs into place. 8. Attach some fly sweets to wire and poke them in, so they buzz around the log. See what I mean? Easy. I don't know what happened to my worms. I think my straws were too narrow. I didn't add enough cream. Or green food colouring. 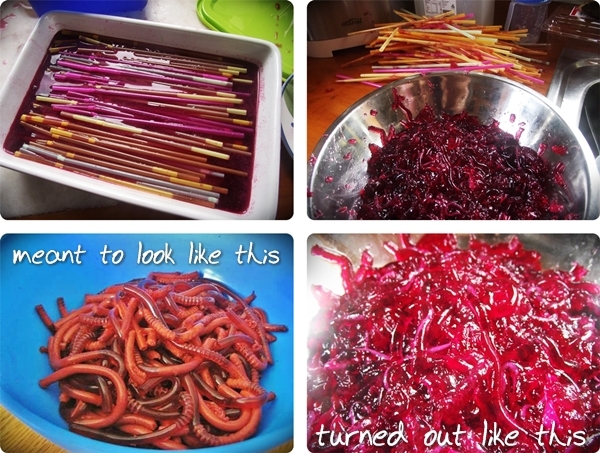 I ended up with a squiggly mess and stained-red fingers from squeezing out the jelly from the straws. So I won't bother giving you my instructions, because my worms sucked. But this lady's worms turned out fab. So go visit her and find out how to do it properly. Good luck! Cover the dough and leave in a warm place for at least half an hour. Roll each dough ball out into circles about 3mm high. Heat a frying pan with a little oil and cook each side for about 20 seconds or until the first sign of bubbles. Sprinkle a little salt over the finished pile, for added flavour. This was loads of fun to do as well as easy and extremely delicious. cook on each side. Then bite into it and let the juice run down your chin. Mmmmm. These were so easy to make, and looked great with the printed "thank you" card attached. I filled my pouches with sweets and chewing gum - but wrapped them in a serviette before placing them in the pouch, as the fabric tends to "shed". 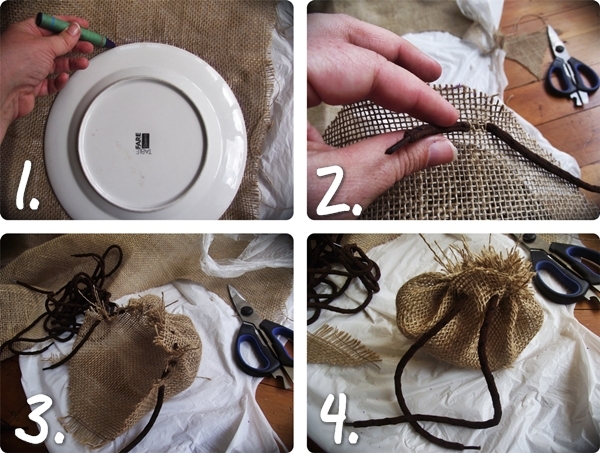 Trace around the dinner plate with a crayon onto the hessian. Cut out the circle. Continue all the way around, threading the shoelace through the existing holes. Draw the pouch closed and Voila! A cute hessian sweet pouch. Print these labels to put on water bottles at your Boy vs Wild party. I bought a six-pack of budget water bottles, removed the sticky labels and replaced them with my own. Print these labels to turn lemonade into Survival Juice at your Boy vs Wild party. I bought budget lemonade, removed the sticky labels and replaced them with my own. 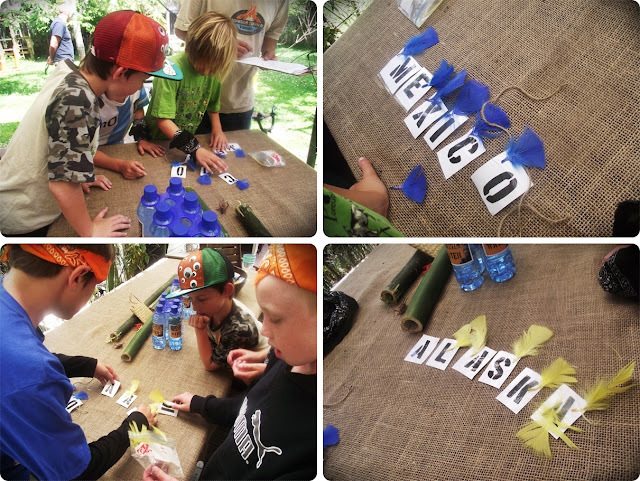 A printable Points Tally sheet for the games we used at our Boy vs Wild Party is available to download here. It is formatted in Excel, and is adaptable for your own party - just replace the details as needed. Laminate letters and cut out. Staple a coloured feather to each letter - one colour for each word. Staple string to the back and then hide around the garden in tricky places for teams to find. There is also a free ready-to-print version on my Kids Party invitation website, which you can simply print out and then fill in the details the old-fashioned way. With a pen. 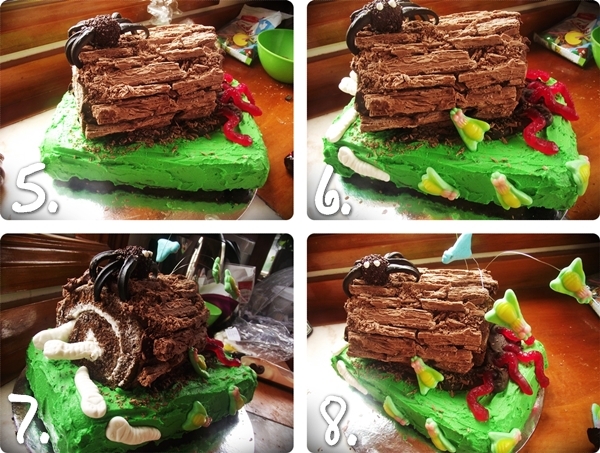 Wow, that cake is super easy but looks so cool. You have a great imagination!! Love the snake meat on a stick too, I could just imagine little boys would love that. Forgot to comment on the birthday post but it looks like it was great fun! Glad the weather stayed fine for you. You're a super dooper cool Mum coming up with all those cool ideas for games, food & decorations! wow Simoney, how are you not doing this as a business????? I'm totally blown away by your creativity! 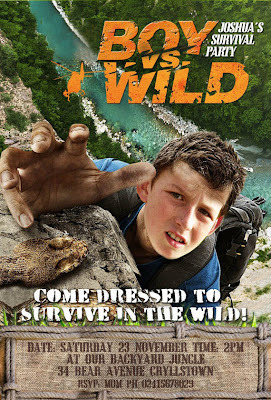 Am going to forward your post link to my friend who's little boy is mad about Bear Grylls!!! I stumbled across your site while doing a search for "Man vs. Wild birthday party ideas". I can't thank you enough for your wonderful description, pictures, printables, etc. I am basically going to copy your ideas and am so excited! Everything is so cute and my son is going to love it. Thank you for the time you spent putting this all together for other's benefit. I really appreciate it! You are the world's best mum to busy mums! I am forever organising parties and searching the internet for ideas, thinkings "surely someone has done this before" so a great big THANK YOU for sharing your hard work! My son is Bear Grylls mad and his 9th birthday party simply had to be an adventurer party....imagine my relief when I came across your amazing blog and the Boy vs Wild theme! You saved me! I couldn't have improved on anything....the July weather gods were kind to us and the rain held off until the last boy had gone home. The obstacle course was a hit, the fear factor style gross food tasting went well (passion fruit pulp makes for great frog spawn!) and that cake was as easy as you said....thankyou for the wonderful ideas. We swapped out the ging making for Dutch Arrow making and the party was a hit.